TIME #20: IS FAT BURNING DUE TO 100 HZ VIBRATION IN MITOCHONDRIA? 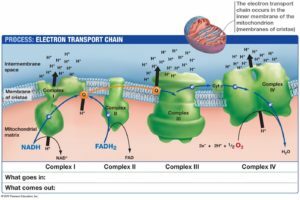 The blog take away: How is the key frequency of beta oxidation made in a mitochondria?Most people believe fat burning via beta oxidation is a fuel mediated mechanism but Dr. Doug Wallace’s data strongly suggests it is linked to the vibration state of the inner mitochondrial membrane. If so, how is the sun’s photoelectric abilities critical to this mechanism in mitochondria? Watch the video in the hyperlink closely from 50:00 – 59:00 for the clue. Recent webinars laid out that cells during the day are in a dark mode plasma state in cells. This is why design because sunlight is being transformed into the DC electric current to be utilized in tissues and our mitochondria to function properly. When sunlight and the DC electric are present it is a signal that UVA or UVB light is present to generate enough current and voltage to affect the optics of tissues. These frequencies changes vary by times of the day and months of seasons and determines the relative transparency or the opaqueness of cells to sunlight. This along with a connection to Earth’s magnetic flux via ground makes the biologic circuit of semiconduction optimized for proper sunlight assimilation in tissues so that the energy from light is not thermalized and lost back to the environment. How much do you know about the natural DC electric current available to us on Earth while the sun is shining? You assimilate the plasma from the sun best when your feet are plugged into the ground where there is a constant unending source of free electrons because the sun is a giant cathode ray of plasma that NEVER turns off. The Earth is a giant anode, and as such the laws of electromagnetism state that from any anode bombarded by a cathode ray the liberations of free electrons from the anode surface is ALWAYS present. You are designed to be conductive to these free electrons this is why your feet and hands have sweat glands on them to make the surface there slightly damp to increase your conductance while the sun is shining and you are barefoot and climbing on Earth. In essence, the anatomy of your design on your feet and hands make you are a natural light bulb for this planet. The filaments in you are the semiconducting circuits. They don’t glow when the electrons are flowing in you because the DC electric current is moving those charges all around you during wakefulness. During sleep the DC electric current disappears and generally your laying on the ground with sunlight or any light present. This physics in you changes and your cells go from dark mode to glow mode. It is at this time your tissue begin to emit ELF-UV light to repair and restore their atomic lattices. Your anatomy requires the socket that is the Earth, to tap this free source of electrons, and the sun is your ultimate battery charger in this circuit. This rebuilds and recharges all the biogenic amines in your tissues and your DC electric current in your body in many ways few understand. Sunlight puts iron where it belongs, specifically into RBC’s, WBC’s, and the cells flowing in our circulatory system when the sun is shining. Grounding to the soil represents yet another intervention that lowers blood viscosity by raising zeta potential, which results in a decrease in RBC aggregation. A change in blood viscosity during sunlight also makes the 93% of water in blood more transparent and more likely to build an EZ in blood plasma during the day. 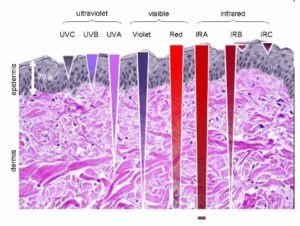 UV light on the surface of the skin releases NO to bring 60% of the blood volume to the skin’s surface to make the normally opaque skin becomes transparent to UV light by using dynamic changes in arteries and blood to help effect this anatomic change. Nothing in the body is static with respect to light. UV light is well known in physics to make things in space transparent and not opaque. Biology seems completely unaware of this PHYSICAL ability of this frequency of sunlight. The Earth’s surface is electrically conductive and is maintained at a negative potential by a global electrical circuit. This circuit has three main generators; the solar wind entering the magnetosphere; the ionospheric wind; and thunderstorms. What did that all just mean? Did I just describe what a cytochrome 1 really does in your mitochondria for you? Yes I did. Iron needs to be coupled to its sulfur couple bound to the cytochrome proteins to work with electrons from foods. Iron also needs to be bound in the cells that circulate in our blood and marrow. If iron is not bound in this way, humans have many blood binding proteins that “sop up the remainder” to not allow any free iron into tissues. If you do have free iron in tissues, we get dielectric collapse in the cell water (reducing the EZ) in those tissues and lose the electric and magnetic abilities that occur normally in these biologic semiconductors. This collpase leads to loss of energy production from the mitochondria in these tissues. Eventually disease manifest. Taking supplements cannot fix this problem. It is a light quanta problem. grounding. With the addition of sunlight the effect is instantaneous because the photoelectric effect works without any TIME delay. When one is in simple direct contact with the ground walking barefoot, sitting or laying down on the soil’s surface as mammals are designed to do with invoke this effect from the inverse Hall magnetic spin effect of electrons. Barrter et al. published in 1962 that there is a clear peripheral fluctuations in blood cells that wholly depends on the secretory peaks of corticosteroids from sun light exposure. Consider what recent effects on grounding show with respect to corticosteroid changes. Moreover, when you consider that sunlight stimulates ferritin and ceruloplasmin increases you can see why iron is designed to be recycled atomically back to the cells that float in blood by way fo the bone marrow. RBC’s formation are stimulated by strong sun exposure too. In 1925 Isachsen and Haberlein found the highest hemoglobin levels in summer months and sunny spring months and lowest in November and December where there was a dearth of sunshine. Guess how iron is re-routed to tissues/organs and becomes a physiologic problem? Under the power of blue light/nnEMF with unopposed by UV and IR. What kind of world are we in now? It is microwaved 24/7 and blue lit by technology devices. This has massive implications for mitochondrial functioning and sulfation of Vitamin D3 in the skin. The corticosteroids changes are proxy markers for a spectral deficiency of sunlight too because sunlight stimulates the ENTIRE anterior pituitary to release hormones in the morning in a circadian fahsion based upon how the frequencies of AM sun change. This makes sulfated Vitamin D3 a special type of seasonal stress hormone for those who live outside the tropical zones on Earth. Within these zones it is always chronically present and a thermodynamic given in how a body is constructed. This means that the mitochondrial haplotype in this area is tightly coupled and will need the fewest amount of electrons to get the physiologic work done in our cells. There is no need to uncouple to make free heat because there is very little variation in solar radiations and temperature inside the tropics. We have other circadian stress hormones related to the production or lack of production of sulfated Vitamin D3 that help offset these environmental changes. I mentioned earlier that cortisteroids have huge effects on ferritin, ceruloplasmin, and erythropoetin levels, and as such, they can affect minerals and their transfers to and fro tissues. These corticosteroid hormones are also made in the anterior pituitary in our system. Some are derived from the neuro-chemical POMC, like the adrenocorticotropic hormone (ACTH) adrenaline-cortisol blend of certain hormones, which enable us to get up in the morning, to regulate the blood cell mass, our sugar concentration to be active, and so on. These are how the circadian stress hormones regulate homeostasis. Sunlight makes our surfaces change their physiologic function. At night our surfaces are opaque and during the day we become relatively transparent to sunlight. These changes alter us physiologically to function by the light frequencies that are present by the hour, day, month and season. Light alters biochemical function below our surfaces because of how it penetrates different tissues differently. For example, blue light penetrates tissues well until it hits dense bone. At that point it reflects back into the tissues to increase their pigmentation. This is why nevi occur in local spots and it is also why melasma is seen in places on the skin that over lie more dense tissues like teeth and bone. Light penetration by frequency is not uniform and was not designed to be because solar radiation are not constant. And that relativity changes the space/time relations of our cells and tissues and is the basis of circadian control mechanisms in cells. For example, daylight is able to shifts blood into the skin and RPE by dermal/ocular pooling due to eNOS and NO release. More than 50% of your blood volume can change your skin surface when sun is present. In the eye sunlight increase water flows to the RPE where red light bridges the large gaps in the macula between the RPE and photoreceptors where our eye camera function is sharpest. The dermal pooling acts to lower our blood pressure. It changes the anatomical structure of the skin by changing the optics of surfaces in the skin and eye. Sunlight becomes a sensory stimulus for the interoceptive system to induce biochemical substrates via photosynthesis in plants and changes in the ATPase using red light frequencies pictured above that affects water chemistry in animals. Sunlight naturally increase sulfated Vitamin D3, histamine, and sulfhydryl groups. Sunlight naturally lowers adrenalin, steroids, testosterone, estrogen, thyroid hormone, DNA and RNA by photolysis. Sunlight induces biochemical reactions via photolysis and it induces coordinated endocrine adaptation effects in the eye and the skin surfaces. It affects the sympathetic and parasympathetic systems. It is the stimulus for the circadian timing mechanism of the body clock via the central retinal pathways. Blue light unopposed has been shown to ruin mitochondrial energy flows and it has also been shown to stimulate estrogen and testosterone release into the blood to liberate more free iron to cause more harm setting the table for many mitochondrial diseases Dr. Doug Wallace has spoken about. The irony is that clinciians seem to unaware that estrogen and testosterone are normally lowered in the blood by surface UV exposure daily. They forget that how a person covers their solar panel can change the photochemical response. I’ve mentioned this to many dermatologists who struggle treating women with melasma. This shows how light bounces of bone and reflects back. I see this in light monitors we use to treat TBI. They advocate makeup and sunscreens that block UV light and they forget their patients sit in front of technology displays liberating chronic blue light and wonder why they cannot treat these women successfully? They just do not understand the non linear aspects of sunlight and what happens when the spectrum is deficient. 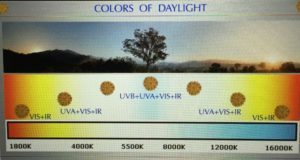 Moreover, if your clothing you wear to work is blocking your skin’s solar panel’s while your eyes are sensing AM sunlight to release the hormones, you also cannot get rid of these hormones rapidly enough via you skin because it is blind to UV light! This fosters uneven pigmentation and depigmentation while also allowing free iron to remain in the blood stream. This is why melasma and vitiligo are gate way quantum diseases in my opinion. The free iron can cause massive change in disease phenotypes because of how it affects the optics within tissues. Iron also has some unreal affects with microwave radiation when it is UNBOUND. If you do not believe it put an iron nail in a microwave and watch what happens. Iron recycling needs sunlight to driving the iron bonding proteins higher to clear the mineral quickly. If the sun’s frequencies are subtracted, filtered, or deficient these things cannot happen in your body. This mechanism of action affects both iron and sulfur re-cycling in the blood and body. Every cytochrome in your mitochondria use iron and sulfur couples in ECT. These details all matter whether you recognize them or not. If you want to believe that ANY magnesium supplement can solve this quantum problem then you are not part of my tribe. If you do, in my opinion, you have a lot to learn about the physics of organisms with respect to light frequencies and spectral deficient states. Lets use the fluoride ion as an example to understand ROS generation and its link to water, NAD+, and oxygen. Fluoride short circuits cytochrome 1 semiconductors NADH/NAD+ out because of its effect on water. The NADH/NAD+ redox couple is a fluorophore protein. This means it can only absorb kinetic energy from electrons around 340 nm deep in the UVB range. Food electrons from carbohydrates are excited by the sun’s light to create electrons with this type of kinetic energy. This is relevant because capacitance (ability to store charge) is directly proportional to dielectric constant of a capacitor. Remember things containing fluoride destroy the dielectric constant in water in foods. This lowers the EZ it can build in your cells especially around cytochrome 1. The higher the dielectric constant is, the more charge can be stored so the higher battery function it has and the less ATP you need to generate. When water is charge separated into an exclusion zone the dielectric constant rises to 160 from 78. This makes EZ water the ultimate place to store the charges that the sun’s light deliver’s to Earth. This explains why the NADH/NAD+ works in the UV range at 340nm. Are you beginning to see why Pollack’s work on water is pretty important yet? Cells are designed to hold massive amounts of negative charge because of the EZ in water is built from UV/IR light. DHA provides the electrons to capture the sun’s light source as electrons are excited to build that EZ in cells. This is why it is the critical part of the antenna complex in cell membranes in mammals. In the ubiquitination series, I showed you a loss of cell signaling in cytochrome 1, means redox becomes reduced at cytochrome 1, and this lowers superoxide burst and affects cardiolipin release from the inner mitochondrial membrane close to mtDNA genes. This is what causes the increase in % heteroplasmy and loss of the melatonin cycle. After absorption of UV light photons on electrons from foods, the photosensitizer, NADH is first transferred to an excited singlet state by the quantized energy in the photon. Then 3 possible decay channels are possible according to QED physics. The 3 cases of decay channels are non radiative, radiative singlet state decay to the ground state, and intersystem crossing to an excited triplet state of the free radical. The last one, may also promote a reaction leading to the singlet ground state by either non radiative decay or by radiative triplet decay. The radiative decays are called fluorescence and phosphorescence, respectively. According to Foote (1968), two alternative reaction mechanisms exist for the decay of the excited triplet state which are called Type 1 or 2 reactions. They are characterized by either the generation of free radicals (Type 1) reactions, or the transfer of excitation energy to oxygen molecules directly in a Type 2 reaction. Roeland van Wijk’s book discusses these effects in more detail for you to review. During Type 1 reactions the triplet state next interacts with a target molecule or protein in a chain reaction, other than oxygen. Stop and think about mitochondrial function now at cytochrome 1 and what should happen seasonally for mitophagy? This is why cytochrome one makes superoxide as its oxygen radical chemical for signaling. This is why seasonal eating is advocated in my book and why ketosis year round might a bad idea when you understand the physics involved. Sunlight is the missing key to all this biochemical talk you hear from food guru’s. Further reaction with triplet oxygen may also lead to the formation of hydrogen dioxide or superoxide. If the electrons from food that are sensed in the NADH/NAD+ or FADH/FAD+ couple and the skin and eye are not sensing the same frequencies of light, the type of free radical a mitochondria makes will not ACCURATELY represent the seasonal signaling. 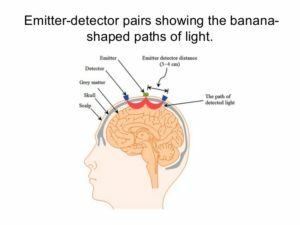 This decoupling of light frequencies thereby effects the downstream events we expect in ECT. Type 1 reactions always result in the release of free neutral or ionized radicals. We use these free radicals to transduce the environmental signals in our mitochondria. This signal controls the distance in Angstroms to the rest of the electron chain. It also effects the Q – cycle’s efficiency that controls cardiolipin, and electron flow from Cytochrome 1, 3, 4. In Type 2 reactions, the triplet state of the photosensitizer directly interacts with molecular triplet oxygen (3O2) which is then transferred to an excited singlet state of (1O2). During this reaction the electron spins are flipped of the electrons in oxygen. Light does this flip, not dietary fuels, as many have hypothesized in their writings. Both reactions are designed to occur simultaneously but when the environment around a mitochondria is altered by pseudohypoxia, the respiratory quotient can be altered dramatically in these cases. The reason for this is because all electrons in ECT are designed to move to oxygen for reduction because of voltage changes and not pH changes. Their flow is 100% dependent upon the electron density, size of the respiratory chain proteins, and the amount of oxygen present at the end of the respiratory chain. (Insert Nick Lane’s new book here the Vital Question or any of Wallace’s work) This makes pseudohypoxia within the inner mitochondrial membrane a very powerful environmental variable because it controls the pull of electrons in ECT. This is why the voltage and not the pH of the inner mitochondrial membrane is the key to fat burning. Insert David Sinclair’s Dec 2013 paper on NAD+ and pseudohypoxia here. Pull of electrons in ECT is measured in voltage. So pseudohypoxia means that voltages in mitochondria are falling (not the pH) and that means the magnetic field developed in mitochondria have diminished because the ATPase is spinning slower. Recall that oxygen is the ONLY paramagnetic gas atom and this is why it is linked to a spinning F0 head of the ATPase that generates a magnetic field. All paramagnetic atoms are DRAWN to magnetic fields. Without these abilities to alter electron spins in mitochondria, cells lose the ability to pulse superoxide at cytochrome 1 and pseudohypoxia is always the result. The quotient is an altered ROS/RNS effect. What are the implications of losing this pulsed superoxide? You lose the ability to collect and move electrons in the brain’s neurons using DHA. This means the mitochondria in these neurons cannot harvest those electrons of their light energy. One of the most interesting features of electrons is their spin and how they change in mitochondria. All free radicals made in mitochondria have unpair electrons. When an electron is bound to a semiconductor like cytochrome 1 and its electron spins are paired, it loses its spin and magnetism and like photons, only acts like a particle and cannot act as a wave. When electrons are bound to a semiconductor they can only act like a particle and not as a wave. This means cytochromes accept the kinetic energy of the electron and begin to vibrate. From Wallace’s work we know that beta oxidation is only possibel when the inner mitochindrial membrane oscillate at 100 Hz. The kinetic energy of the incoming electrons are what generate that oscillation in the inner mitochondrial membrane. Beta oxidation, according to Wallace, is about the oscillation rate, and not the fuel source, as many of your food guru’s seem to believe. I follow the data and not the dogma of any paradigm of thought. Singlet state oxygen predominates in a microwaved blue lit world and your cells never see triplet superoxide again because your mitochondria lose the ability to make it, until you get rid of this badly functioning mitochondria by mitophagy. What is the signal that is ongoing in a tissue? According to the work or Fritz Popp and Roeland van Wijk, it is the ELF-UV light release seen in cells as a response. This is why all disease must first attacked by changing your light environment and not looking into your genome or in your diet. Most people do not know about these non linear states found in a semiconducting electric currents because they do not understand the physics of organisms. This queer electric feature is very useful to living things with mitochondria. In this way, none of the stored light energy in an electron in a cells lattice can be thermalized. This means that an excited or ground state electron that is paired in mitochondria, cannot generate any heat if it is stored in our tissues in this way. When the electron is not paired a free radical is made and light photons are liberated from the excited electron. As a result, your O2 levels drop in your mitochondria and pseudohypoxia is the result. Do not forget in cell membranes DHA and water meet everywhere in the brain next to that CSF lake. There is a deep reason for this. This is how the antenna works in the human brain to pick up magnetic flux from the geomagnetic field, the Schuman frequency, and to sense the osciallations of the grey matter mitochondria in the brain. This can be seen in an EEG recording and all the waves that make it up. This is why neurology look at these recordings to see illness and health. This is how electrons are transferred from an outside source to inside capacitor (EZ) that is a repository for sunlight for cell signaling. Everything is quantum. What is correct isn’t always popular and what is popular is not always correct. Nature is exquisite experiment rather than a struggle for popularity. 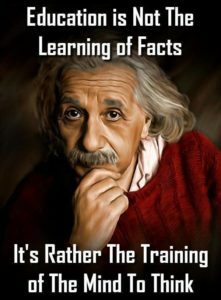 The explanation requiring the fewest assumptions is most likely to be correct, but this does not imply the concept is simple to understand.